Nothing gives many local politicians greater joy than complaining about an intrusive and overbearing federal government these days, but another federal takeover of the state’s prison system may be the last hope Oklahoma’s Department of Corrections employees have. 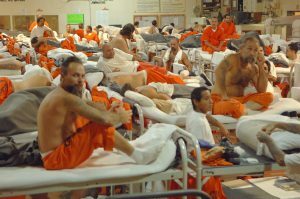 The agency houses 3,000 more prisoners than it did in 2008, but does so with 1,000 fewer employees and $34 million less annually from lawmakers. The employees have been “efficiencied” to death, by being asked or flat-out bullied into doing more with less year after year after year. Yet finding more efficiencies seems to be the only focus of the agency’s new director, Robert Patton. In recent months the agency has actually reduced security posts, despite the fact Oklahoma has fewer officers per inmates than any state in the nation. And Oklahoma held this dishonor before the recent influx of prisoners from county jails, which helped fuel a surge in net growth of 2,200 inmates this year. The director is thinking about closing towers, an important security feature in six of the state’s prisons, including the maximum-security Oklahoma State Penitentiary. While he ponders their efficiency from an office in Oklahoma City, many of the officers and staff who work in these prisons feel the towers, and the officers with rifles in them, are a very real measure of security. Patton also wants to find efficiencies in the overtime budget, which is at record levels. Unfortunately, his solution, apparently, is to simply prohibit overtime for lieutenants, who have been forced to work thousands of extra hours annually for years. All this move does is dump more overtime on lower-ranking officers, while drastically and abruptly reducing lieutenants’ income. But, what is really tragic in all of this is that staffing levels could have been improved by lawmakers this year. Unfortunately, as usual, their priorities were focused elsewhere. State troopers will receive a 23 percent raise from lawmakers in January and job applications have already almost tripled as a result. The same cannot be said for DOC, whose officers were given only an 8 percent raise, amounting to 78 cents an hour for cadets, while more than a thousand DOC employees got no raise at all. In July, one month after this raise went into effect, more employees quit the agency than were hired, which is typical. The DOC needs a much more substantial investment from the Legislature, both in dollars and attention. Until the department can provide a relatively safe working environment, at a respectable wage, with hours that allow an employee to have some semblance of a family life, the agency will continue to fail to recruit and retain sufficient employees for these dangerous, critical jobs.